To use Noor, you must be running WordPress 4.7 or higher, PHP 5.6 or greater, and MySQL 5 or greater on your server. We have tested it on Linux, Mac, and Windows. Below is a list of items you should ensure your host can comply with. 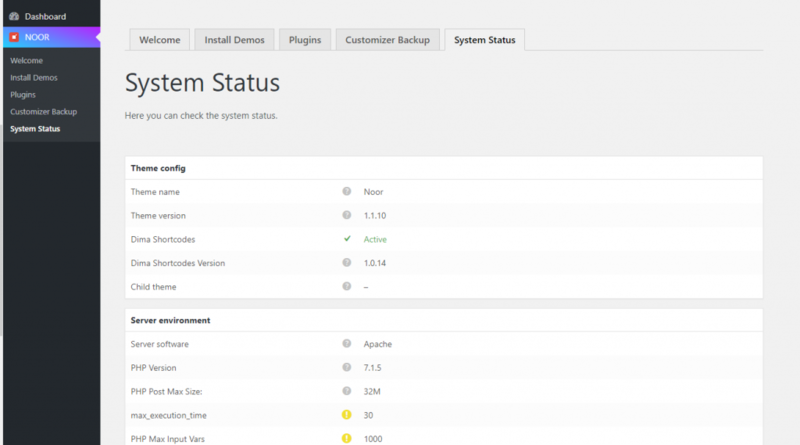 You can verify your PHP configuration limits on Noor theme by just going to your WordPress dashboard > Noor > System Status or by installing a simple plugin Host PHP Info. Please note though that many hosts will try to keep the PHP limits low without reason. However you are paying for it, and therefore should be getting the worth of your money.